I'm still thinking about how I want to finish off this quilt. In the meantime I thought I'd share a bit about how I created this in the first place. First you need to prepare the templates. You need eight identical 45 degree diamond templates. The success of this project is based to a high degree on how well you make these templates. Don't rush. Be careful and consistent with how you cut and mark the templates. If you are lucky enough to have access to drafting software and a larger format printer, you can create them on the computer. For the rest of us, we have to do these the hard way. You'll need wide, long paper. I like the 18" wide roll of paper from the children's department at Ikea. 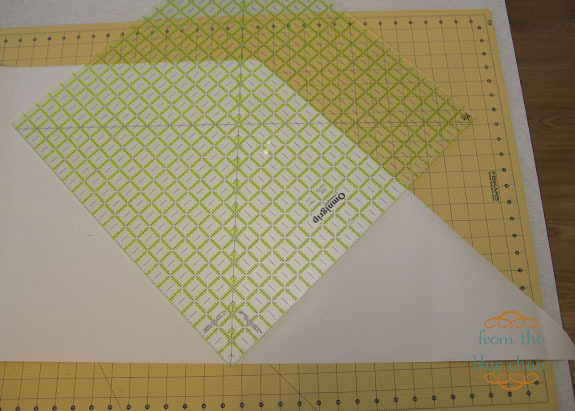 This works great for paper piecing. Make the first cut on a 45 degree angle. 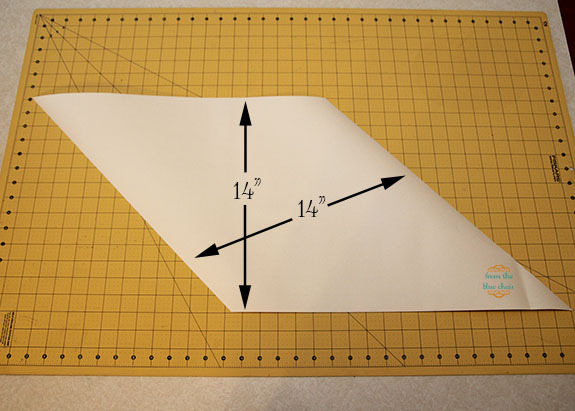 From that angled cut, measure 14" (or however wide you'd like your diamonds). 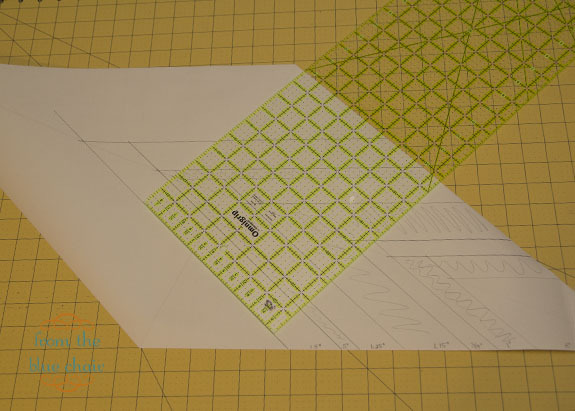 You can see I've lined up the 14" mark of my larger ruler along the cut edge. I'm using a 20.5" square ruler. 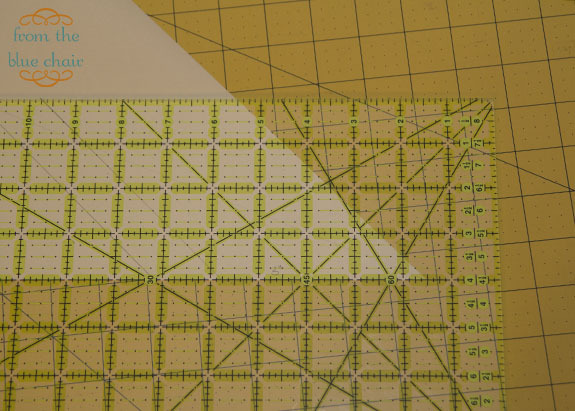 It's one of my favorite rulers and works great for projects like this. 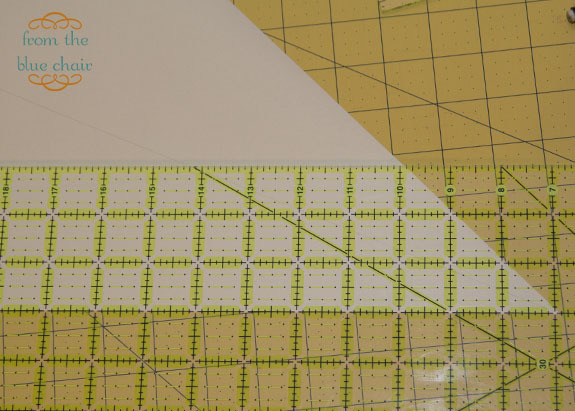 You can certainly just use the 14" line of a standard ruler and move it along the side to mark the line. Now cut the first side of the diamond. Next measure 14" from the base of the diamond and cut the excess off the top. The diamond needs to measure 14" across from one side to the other. Now cut eight of these. Carefully draw a line through the center length of the diamond from point-to-point. This is mainly for a reference. Make sure your measurement from one side to the other is the same going both directions. Start marking the stitching lines. My initial diamond was 3". I measured and marked 3" from the bottom line and then 3" from the angled line. 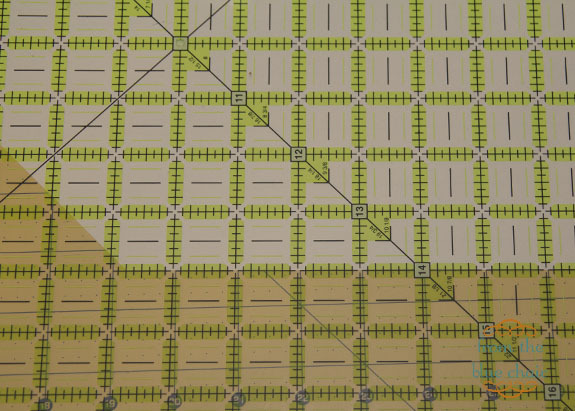 The points of the diamonds/borders should intersect the line drawn from point-to-point. 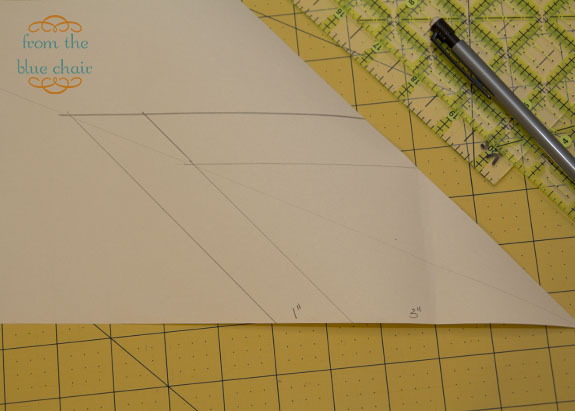 To keep everything straight, I kept track of my measurements to copy onto the other templates. Mark the next border. Mine is 1" wide so I measured 4" from the bottom edge and 4" from the angled edge. 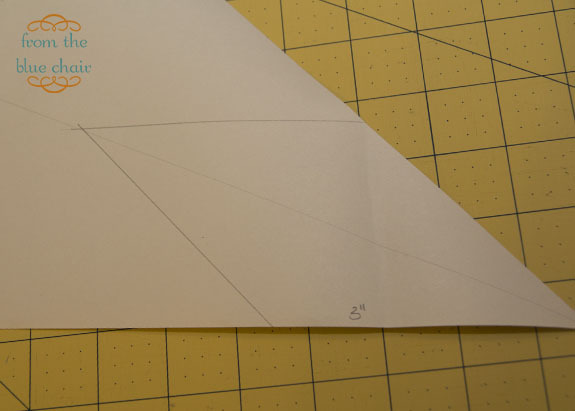 Always measure from the paper edge rather than from marked lines. If you are slightly off in your markings, this will be compounded each time you mark from those lines. 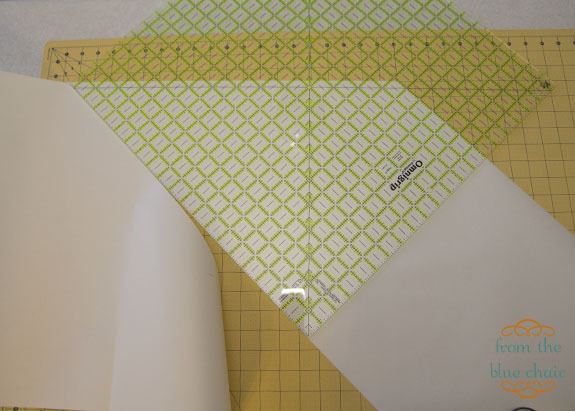 If you always mark from the paper edge, slight mistakes will be corrected with the next round of borders, minimizing problems when matching seams. 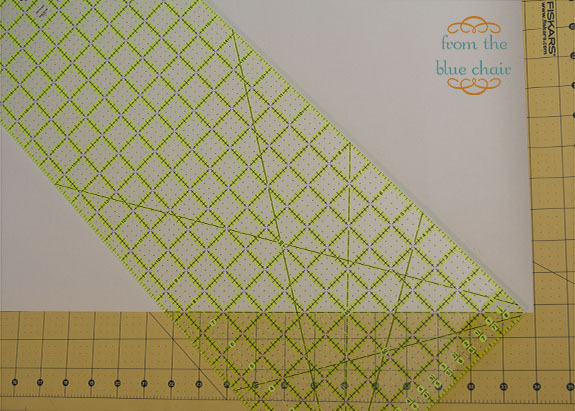 Make sure to extend one of the stitching lines to complete the border. It doesn't matter which strip you sew to the edge, just be consistent in always marking the same side as the longer border strip. Continue adding borders. 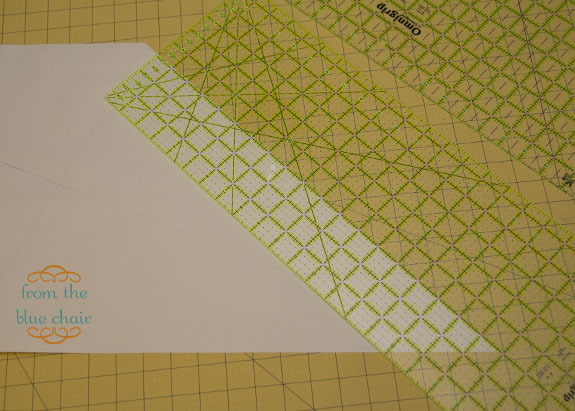 With my design in mind, I colored in the borders on the template that would be prints and left the white borders plain. As you get farther out to the edge of the diamond, it does get challenging to mark the borders. These templates were very large and cumbersome. 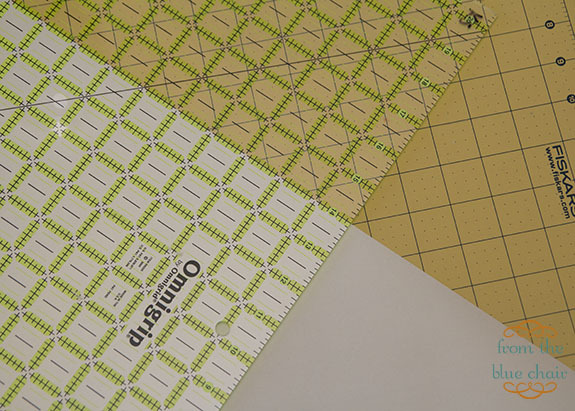 Continue marking stitching lines from the same paper edges for consistency. The large ruler comes in handy here. 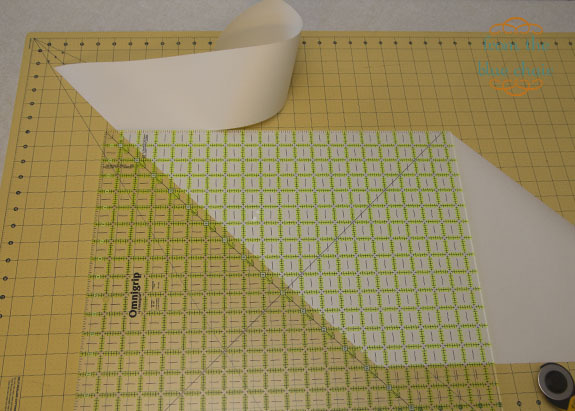 If you don't have the larger ruler, place a standard ruler as shown and slide it along the paper edge as you mark the stitching lines. Compare templates once each is completed to make sure lines match up correctly. It's better to correct any issues at this stage than after an entire diamond is stitched. Use pencil to mark lines, not pen which could possibly bleed through when ironed. Make your templates any size. These 14" wide diamonds produced 37" long unfinished diamonds. Make this as simple or complicated as you like. 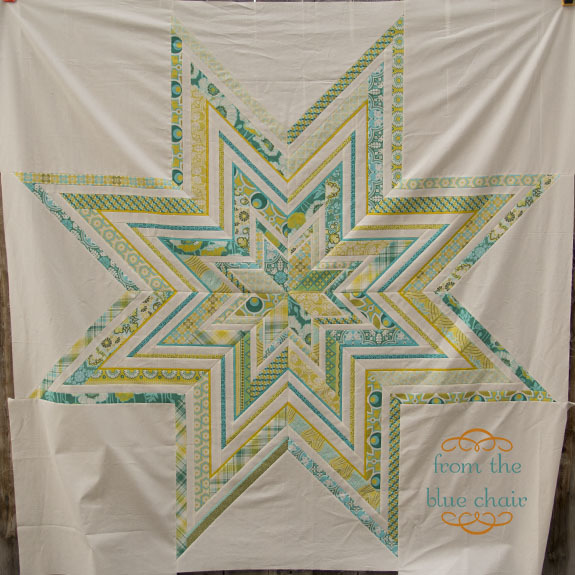 You could create very simple templates using just a few larger borders, yet the finished quilt would still have great impact. My borders range from .25" to 1.75". 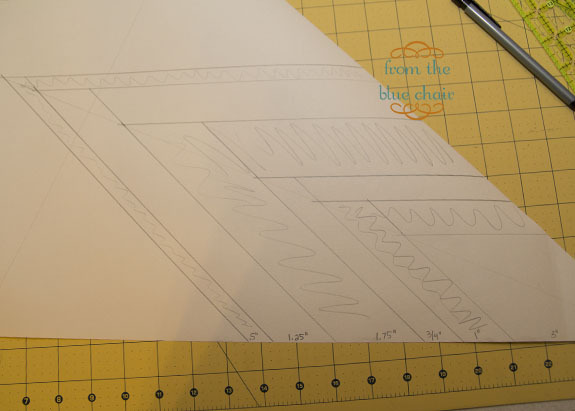 The .25" borders are tedious, but I love the look created with these skinny accent strips. 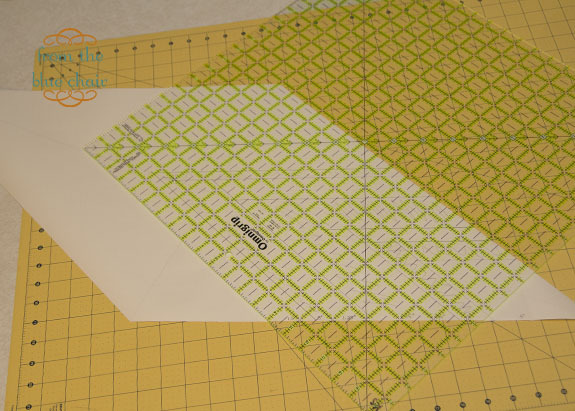 Once your templates are complete, it's just simple paper piecing from there. I didn't take many pictures of that process, but I will post another simple tutorial in a few days on how that portion is done. Thank you for sharing! Really want to try this! I really want to try this, thanks for the instructions, they are very clear and easy to understand! Wow - so much great information here! This is on my someday list. 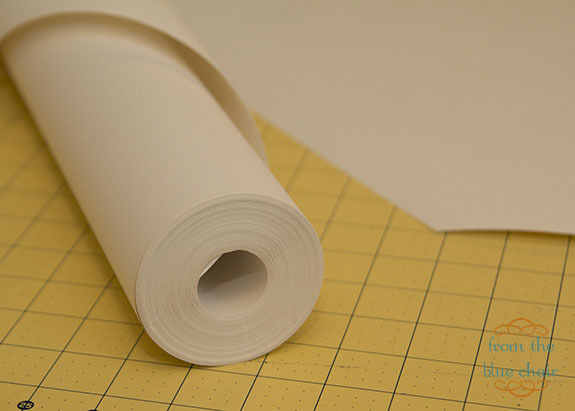 Thank you for sharing this, the paper roll is a great idea, I think I have one of those around here somewhere. You can also get the ends of newspaper rolls. This is usually a lot of paper, but not enough for the newspaper to print a run. And they are free. Dear Kati! Thank you so much for sharing your process for free. I feel so inspired and wantto start right away, I only need som paper and ohh.. a couple of extra hours in the day would be great ;-). Love all you do! It is so fresh and ... dare I say it... lean! What a gorgeous quilt! I love the colors. And your tutorial is fabulous. Thanks so much for sharing the process and photographs. I'm totally attempting this. I'm off to Kinko's to get the templates printed! You should patent this pattern and sell it - I'd buy it ! !